Coming up with fun school lunches is not always easy! I was playing around with a few recipes today and came up with these tasty treats. With no added sugar they are perfect for a lunch box. They look and taste like dessert thanks to the pumpkin pie spice and cream cheese but are packed with healthy ingredients to keep your kiddos energized and focused through the day. This photo was an “outtake” but it made me laugh so here you go. I guess he thought I wouldn’t notice since I had a giant camera in front of my face. They do smell pretty tempting!! Peel then chop potatoes into 1″ pieces. Coat with olive oil and bake at 400 for 35-45 minutes, till easily mashed. Rice or mash into a large bowl. Add flour, baking powder, salt, pumpkin pie spice, and water. Mix well. Set oven on 350. On a lightly floured surface, roll dough out till 1/3″ thick and roughly rectangular. 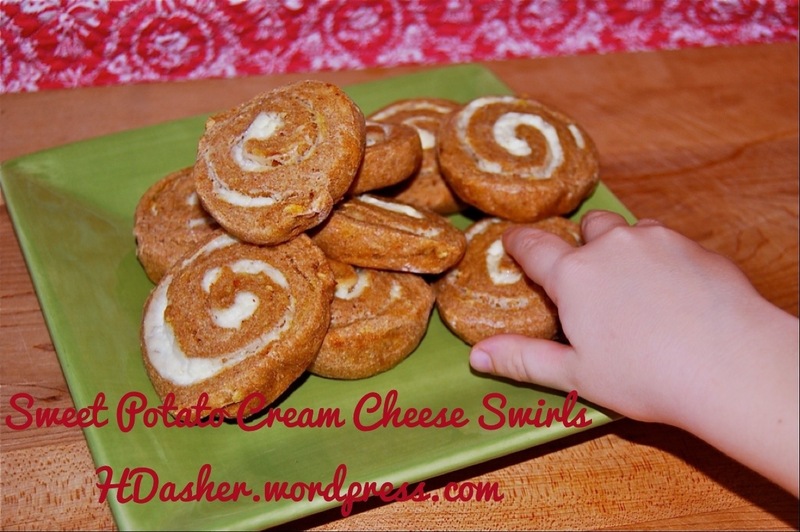 Spread with cream cheese, leaving an inch at the top uncovered. Roll up tightly, just like a jelly roll. Using a sharp knife, slice into 1/2″ spirals and place on non stick baking sheet. If you are having trouble slicing, you can cover and refrigerate the roll for an hour or so. Bake spirals for 30 to 35 minutes till lightly golden and toasted. Cool on racks.